The job postings listed below are not paid or salaried positions (unless otherwise noted on that post). Instead, each person is responsible for raising full financial support by building a team of supporters who regularly contribute to his or her Cru staff account — to provide a monthly income. The Josh McDowell Ministry with its headquarters located 15 miles north of Dallas in Plano, Texas, is composed of missionary staff, paid staff, interns, and volunteers – all committed to serving others until the whole world hears about Jesus. If you are interested in any of these positions as a supported staff member or as a local volunteer, please complete the online application form. Until the whole world hears! Are you skilled in communication? We need help in getting the word out! People want to know when Josh is coming to their city or when they can hear him on the radio or TV interviews. We are looking for a person who is skilled in coordinating a communication strategy for Josh McDowell Ministry key events and resources. If that is you, then we would love for you to come serve with us! Are you detail-oriented, skilled in record-keeping, composing documents, word processing, reporting, tracking and small project management? Then JMM is the place for you! Josh has authored or co-authored 148 books in 87 countries and 128 languages. We are looking for someone who is passionate about getting even more of Josh’s books into the heart languages of seekers around the world. It starts with our leadership. Duane Zook, our CEO, travels the world to fulfill our mission of serving others until the whole world hears about Jesus. To assist Duane, we’re looking for an individual just as passionate about serving others—one with an interest in and sensitivity to people and detail. In addition, you will also assist other executives. If you want to experience what it is like to serve in a ministry with a distinctly Christian commitment, JMM is the place for you! Do you have a passion to build relationship? Do you like to travel? We need a Global Publishing Director for Africa to work with publishers to provide resources to help true followers of Jesus live, defend, and share their faith to fulfill the Great Commission. Do you have a passion to build relationship? Do you like to travel? We need a Global Publishing Director for East Asia to work with publishers to provide resources to help true followers of Jesus live, defend, and share their faith to fulfill the Great Commission. Do you have a passion to build relationship? Do you like to travel? We need a Global Publishing Director for Latin America to work with publishers to provide resources to help true followers of Jesus live, defend, and share their faith to fulfill the Great Commission. Josh McDowell Ministry has a heart for ministering to people in their heart language around the world. You will be the one to ensure that our International Directors are well-coordinated and productive by managing its procedures and coaching its people. The Global Publishing team mission is to provide resources to help true followers of Jesus live, defend, and share their faith to fulfill the Great Commission. Liaison to Cru International and work with the VP of Global Publishing to make decisions for operational activities and set strategic goals for this global team. The graphic designer gives direction and purpose to visual media. This person uses the visual arts to communicate the mission and vision of JMM. He or she helps the ministry highlight its uniqueness in the world of resources and live events. If you possess skills in graphic arts, a keen eye for detail, talent in visual communication and strong creativity, then JMM needs you! Seeks vibrant individuals who want to see His Kingdom grow by building dynamic relationship and shaping culture. Come use your professional skills to gain hands on HR experience. 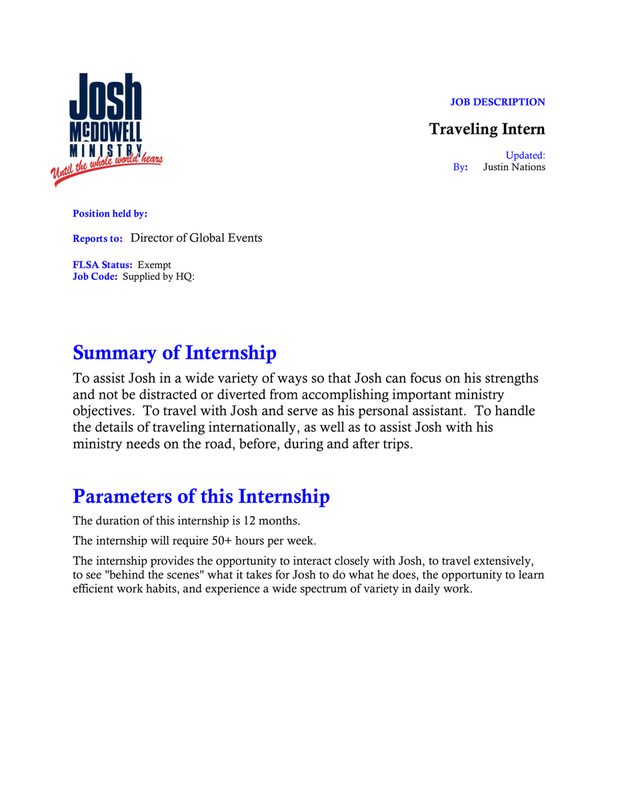 Use your professional skills to help Josh and his team in the communication of the message which God has entrusted to Josh by carrying out a wide variety of administrative tasks and assignments which will allow Josh and the team to be as effective as possible. Jump in and gain first hand experience in PR, marketing and designing presentations. Josh McDowell Ministry is all about ministering to people in innovative ways and reaching them through new media technology , especially in hard-to-reach geographic areas where missionaries can’t go. We’re looking for a person who, while having technical skills in social media, websites, blogs, e-books, podcasts, app development, email marketing, etc., is also passionate about presenting ministry messages in creative formats. If you’re a person who likes to be on the cutting edge of technology and has experience in graphic design or web design, this could be for you. Please check out our Missionary Positions and Internship opportunities. ¿Hablas español y leer? ¿Te gustan los medios de comunicación social? Entonces te necesitamos! Josh McDowell Ministry has a heart for ministering to people in their heart language and we are ready to reach our Spanish-speaking audience in the United States and around the world. We’re looking for a person who is proficient in Spanish and has the customer service and technical skills to do ministry on Facebook, specifically collaborating with existing English ministry content, creating Spanish-specific content and answering posts and emails on the ministry’s behalf. If a picture is worth a thousand words, then is a video worth a million? Here at Josh McDowell Ministry it very well could be. We have a library full of powerful images waiting to be used as well as an abundance of live events and messages coming up that need to be captured creatively and communicated electronically. If you have an eye for dynamic visual presentations and embrace a vision of true followers of Jesus everywhere who live, defend and share their faith, then Josh McDowell Ministry is the place for you! Well-told stories inform and inspire. We need talented journalists to help us tell the world about what Christ is doing to advance His kingdom through Josh McDowell Ministry resources and live events. We’re looking for creative individuals whose writing skills can engage minds and move hearts. Your talent will help us inspire donors, mobilize volunteers, publicize JMM’s passion and report on God’s blessings around the world. If you dream of sharing the stories of changed lives that paint word-pictures of God’s grace, this is an opportunity you can’t afford to pass up.